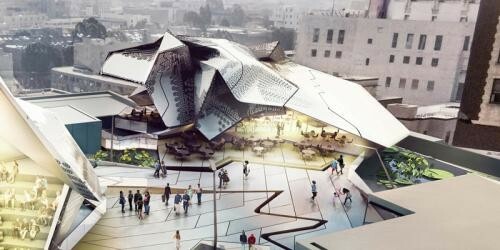 The Main Museum of Los Angeles Art is a non-profit contemporary art museum conceived of by visionary developer Tom Gilmore and located in the heart of the Old Bank District of Downtown Los Angeles. Capitalizing on the tension between historical and contemporary architecture, the project is part adaptive re-use and part new construction. It is devoted to engage the public with the most important ideas of our time through the art of Los Angeles. The project is located beneath, within, and on top of the historical Farmers & Merchants Bank, the Hellman Building, and the Bankhouse Garage at 4th and Main Street. The museum is a three-dimensional space that weaves through these buildings, inhabiting their hidden recesses and forgotten spaces. It is an unorthodox museum form that withdraws from iconicity and creates an interior world, which occasionally reveals itself to the outside world. Rather than the traditional presentation and preservation of a collection in an exclusive environment, the museum embeds art deep into the space and life of the city. A sequence of architectural objects draws visitors through the space. Objects penetrate through floors, peek over rooftops, and inhabit dark interior voids to produce a set of discrete experiences rather than a spatial continuum. Finished primarily in black or mirror chrome, the objects create a sense of mystery and opacity. Often, they recede into the background, allowing visitors to focus on the exhibitions and performances. Museum galleries are located in vast basement and sub-basement spaces, featuring turn-of-the-century bank vaults and other historical features that further add to the ensemble of objects. At ground level, the museum directly connects with both Main Street and 4th Street. The main entry is through the historic Hellman Building’s foyer on 4th Street. 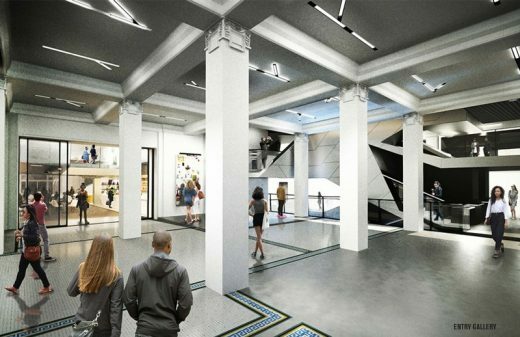 The museum restaurant, located within the iconic Farmers & Merchants Bank, provides a second means of entry to the museum, and itself is a new form of restaurant. 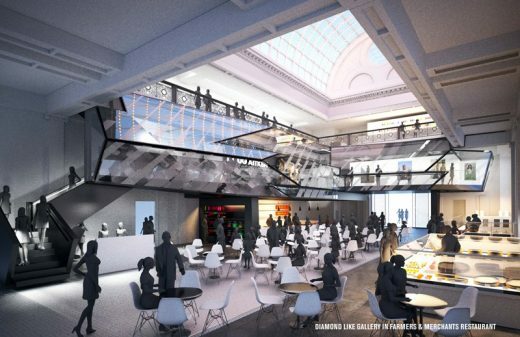 The museum penetrates into the restaurant, in the form of a diamond-like glazed gallery space perched above the dining room. This gallery provides views of art, performance, and people from above and below; the restaurant is thus transformed into a contemporary cultural space where art, food, and the social life of Downtown are interwoven. The rooftop of the Bankhouse Garage is transformed into a new public space, a new ground in the city. It includes a promenade with a sculpture garden, cafe, and amphitheater. Visitors can access this space from Main Street, 4th Street, or Spring Street. On the west facade of the Bankhouse Garage, a double-skinned multimedia art wall contains circulation connecting the promenade to Spring Street Park below. 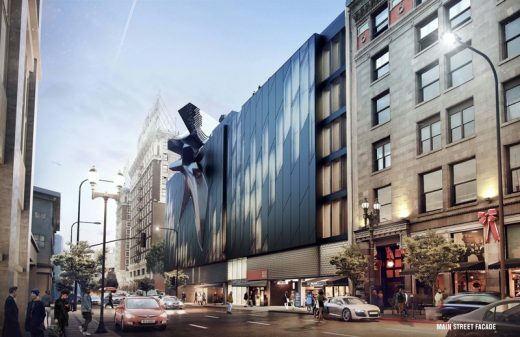 A new façade on Main Street draws attention from street to roof, offering glimpses of the café and sculpture garden, yet never revealing the extents of the project in full. 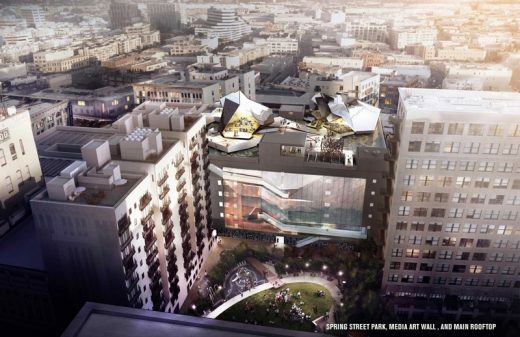 The rooftop becomes the ‘fifth façade’ of the museum, easily viewed from the tallest buildings in Downtown Los Angeles. Unlike the generalizing forms of coherence that we have become familiar with in this late period of digital design— such as smoothness and continuity—this project is ultimately based on a new, non-literal form of coherence created by the uniqueness of specific objects and the vicarious relations produced between them. Rather than an endless space, the museum becomes a set of discrete, yet durable experiences of art and architecture.